Now this might seem like a bit of bizarre claim. When I say that Futurama inspired Doctor Who I am talking about the revival, and even then I am really only talking about the Russell T Davies era. 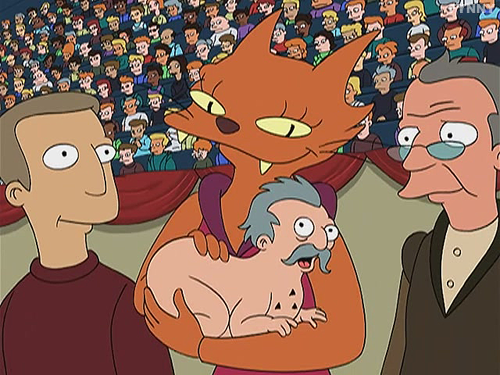 I think a lot of the humor in Davies’ time owes something to Futurama. This is not to say that Davies humor was not unique, but I think Futurama, which Davies is a self confessed fan of helped to shape a lot of the comedy in those early Davies stories. 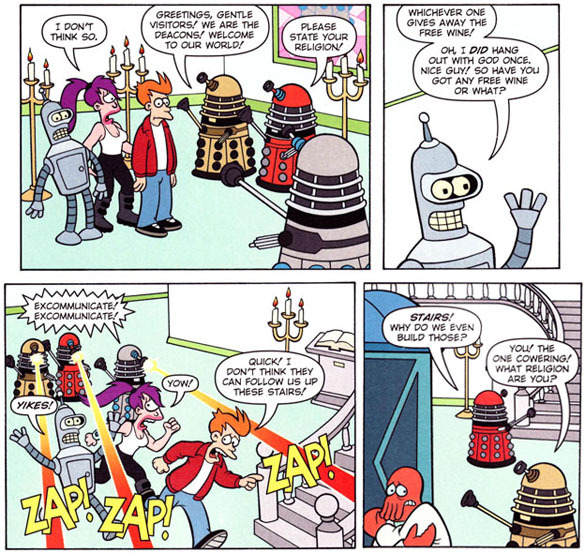 At the same time however it is worth noting that the original Doctor Who series was a big influence on Futurama too. 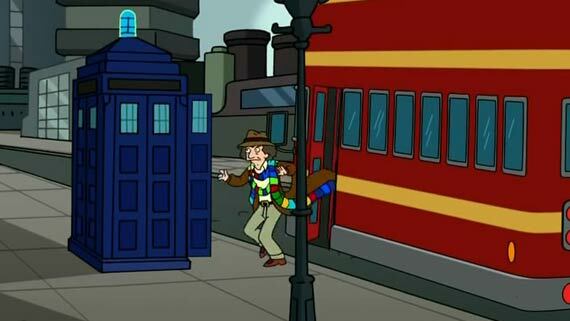 Futurama has even paid homage to Doctor Who (as you can see above) many times. In this article we will be examining the relationship between both genre classics and ultimately what they owe one another. Futurama’s influence on Who can only really be found in the Davies era. When Russell T Davies took over the show in 2005 he started to inject a lot more overt comedy into the show than ever before. 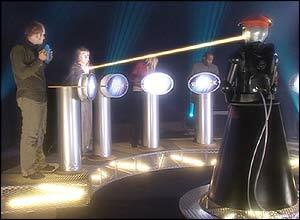 He had stories with burping wheely bins, farting aliens, women being turned into slabs of concrete, cursing aliens, game shows thousands of years in the future and modern day pop music being looked on as classical music in the future. Many longstanding Who fans criticized Russell harshly for this with some critics accusing Russell of making the show into a parody of itself. I myself tend to lean towards this way of thinking. Whilst I do love the Davies era overall, the humor in it is a bit too much for me at times. 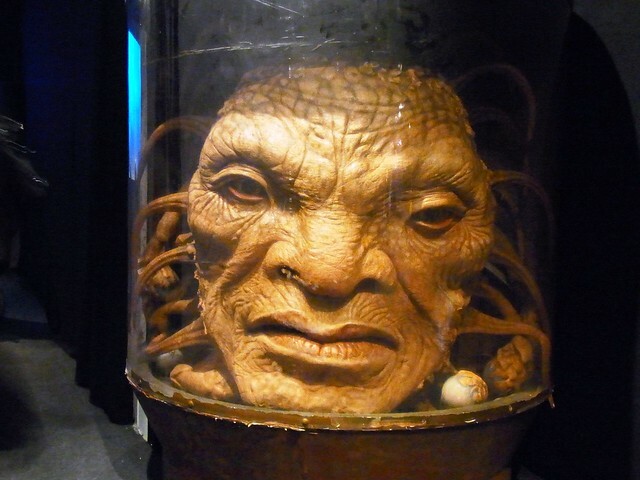 I don’t think overt comedy ever works in Doctor Who because it is such a larger than life idea. The idea of a man travelling through time and space is a pretty wild concept, so in order to stop it from seeming like something like Futurama it has to be taken as seriously as possible. This was also why I had a problem with Douglas Adams tenure as script editor and Adams himself later acknowledged that he regretted the level of comedy that was being injected into the series during his time. Due to the fact that Futurama was one of the most prominent sci fi comedies of all time it would make sense that Davies would look to it for influence. I think Russell actually took inspiration from Futurama more than other sci fi comedy classics like Red Dwarf and The Hitchhikers Guide to the Galaxy. The stories of Davies’ run that are most like Futurama to me are the three year five billion episodes. “The End of the World”, “New Earth” and “Gridlock”. The future that we see in those episodes is actually very similar to the one from Futurama. Both are more comical with the advances in technology being presented more as witty jokes. Other science fiction stories often present advances in technology as warnings such as in Terminator with Skynet or in Classic Who itself with the Cybermen or they present them as being inspirational like the original Star Trek series. Both the year five billion Doctor Who stories and Futurama however instead present them as jokes and don’t even attempt to ground them in any kind of scientific plausibility. Though the Cybermen are complete fiction they are not quite as out there as someone making the speed of light go faster, casually reshaping the continents, or bringing the dead back to life and keeping their heads in jars and feeding them fish food. Both also attempt to present the future as essentially being the same as today in terms of a lot of attitudes and problems. 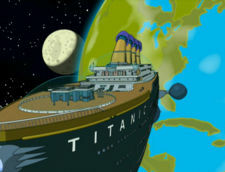 Even with all of the advancements in technology, Zapp Brannigan still has the same sexist attitudes of misogynists today as do other characters throughout the series such as Fnog and Professor Farnsworth, whilst Thomas Kincade Brannigan still has old fashioned attitudes towards a homosexual couple in “Gridlock”. Thomas Kincade’s surname is most likely an homage to the Futurama character too. One Futurama comic book “Who’s dying to be a Gazzilionaire ” even features a futuristic version of a modern game show now controlled by aliens with the losers being disintegrated just like in “Bad Wolf”. 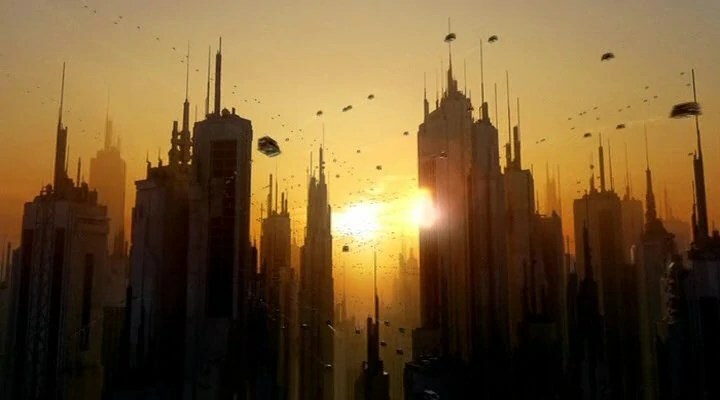 Both Futurama and the last year five billion story of Davies era are set in a future version of New York, which in both cases is called New, New York. There are a number of similar jokes from Futurama littered throughout the year five billion stories. These include the idea of modern day pop music being thought of as classical music in the future, and also the idea of human waste being recycled as food. In both cases we have someone from the present, Martha Jones and Philip J Fry learn this whilst eating a sandwich much to their horror. Even visually Davies year five billion looks like the future from Futurama, full of hover cars, animal people and heads in jars. The idea of animal people is a common trope in science fiction but both Doctor Who and Futurama present it in an absurdly comical way, even dressing their animal people from the future in contemporary clothing to almost highlight how ridiculous they look. The Futurama parallels don’t stop with the year five billion stories however. 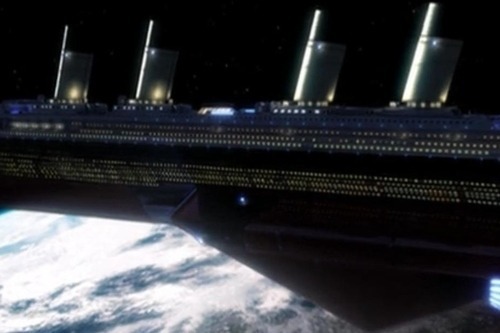 The Doctor Who 2007 Christmas special “Voyage of the Damned” revolves around the idea of the Titanic in Space which is exactly the same premise as the earlier Futurama episode “A Flight to Remember”. Both stories essentially remake James Cameron’s blockbuster in space, having the main characters in both instances become involved in a tragic love story with someone on board the vessel who doesn’t survive the catastrophe. 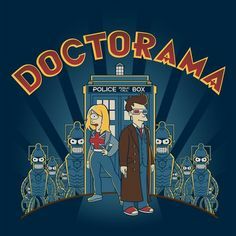 Whilst I would never say that Futurama was one of Doctor Who’s main influences, overall I think its fair to say that a lot of the humour in Davies’ time comes from Futurama and certainly the year five billion in Doctor Who is essentially like a live action version of the future in Futurama. Matt Groening the creator of Futurama is a huge Doctor Who fan. He has included a number of references to it in his other classic series The Simpsons. 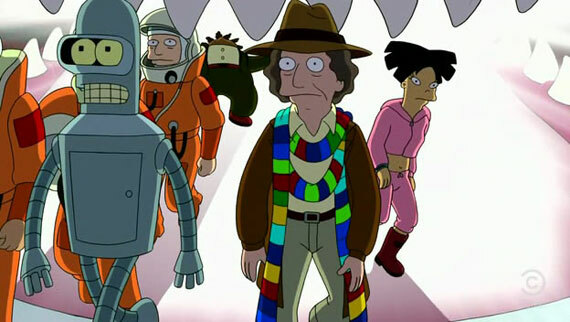 Groening’s favourite Doctor is the 4th Doctor played by Tom Baker has appeared a number of times in both Futurama and the Simpsons. 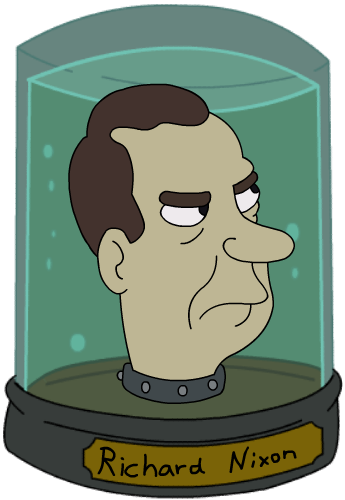 However Who’s impact on Futurama goes bigger than a few references. The character of Leela from Futurama is both named after and largely based on Leela from Doctor Who. Neil Gaiman has conformed that Doctor Who’s Leela inspired Futurama’s. Both Leela’s are strong, amazonian type of women who completely reverse the idea of the female characters in science fiction being weak and are actually far more powerful and violent than any of the male characters they come into contact with. 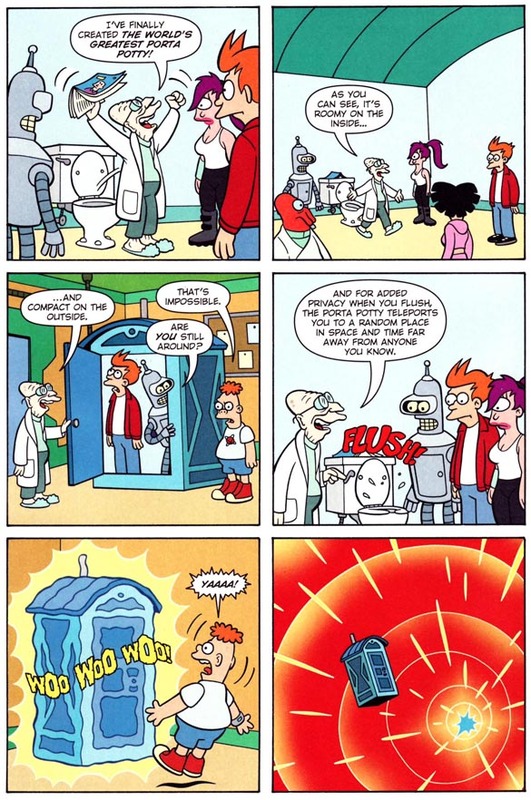 A Futurama comic titled “Doctor What” is a complete parody of Doctor Who. It features parodies of the TARDIS, Daleks and K9. Panels from Doctor What issue of Futurama. Its quite funny in a way that Doctor Who inspired Futurama and then Futurama inspired Doctor Who. It shows how Doctor Who is unique in terms of the fact that it practically does go on forever. It can inspire something, but then because it will go on long after that has finished, the next version of Doctor Who after that can ironically take a certain amount of inspiration from it. Very interesting! It’s ironic that Red Dwarf and HHGttG didn’t play a bigger role in the tone and specifics of Davies’ humor in Doctor Who. Adams certainly influenced the show directly while working on it, and vice versa. And the topical humor in Futurama seems like a bigger stretch for Doctor Who, even the new series. Of course, you could make a case that Coupling has a bit of influence, but it feels too little, too late from he British side of things. Thanks again for laying it all out. Thanks for your reply. Coupling was written by Moffat so I don’t know if that is so much an influence as more just similar styles of humor. I definitely do not think that Moffat draws on Futurama for influence. TBH that’s why I prefer his sense of humor. Its less overt. Sorry. I was trying to be funny about Coupling. I know I tend toward commenting on myself too much with *smile* and *grin*–this is one case where I should have allowed the urge. And yes, Moffat’s humor is more self-contained. For the kind of show Doctor Who is, with all of its inherent dignity and scope, that sits better with me, too.